Lucas Patrick McCown (born July 12, 1981) is an American football quarterback for the New Orleans Saints of the National Football League (NFL). He played college football for the Louisiana Tech University Bulldogs, and was drafted by the Cleveland Browns in the fourth round of the 2004 NFL Draft. He also played for the Tampa Bay Buccaneers in 2007, 2008, Jacksonville Jaguars from 2009 to 2011 and Atlanta Falcons in 2012. He is the younger brother of current Browns quarterback Josh McCown and former Texas A&M quarterback Randy McCown. Most plays by a freshman in a single game (80) - Louisiana Tech vs. Miami, FL, Oct. 28, 2000. McCown gained 444 total yards during the game. Most attempted passes by a freshman in a single game (72) - Louisiana Tech vs. Miami, FL, Oct. 28, 2000. He completed 42 of those passes. Most completed passes by a freshman in a single game (47) - Louisiana Tech vs. Auburn, Oct. 21, 2000. He attempted 65 passes in all. Most seasons of 2000+ yards (4) - From 2000—03, McCown gained 2,544, 3,337, 3,539, and 3,246 yards. McCown was drafted by the Cleveland Browns in the fourth round of the 2004 NFL Draft. He went on to start in four games for Cleveland. After the season he was traded to the Tampa Bay Buccaneers on the weekend of the 2005 NFL Draft. During week 13 of the 2007 NFL season, McCown produced his finest performance as an NFL quarterback, throwing for 313 yards and 2 touchdowns during an emergency start for the injured Jeff Garcia in Tampa Bay's 27-23 victory over the New Orleans Saints. McCown started the next game against the Houston Texans and was 25-38 for 266 yards and no interceptions, but a loss. He came in relief in the second half of week 16 and threw for 185 yards and one interception. McCown started the last game as the Bucs had already clinched a playoff spot. He threw for 236 yards and one interception with 2 TDs. McCown played in 5 games, starting 3, during the 2007 season, and threw altogether for 1,009 yards, 3 interceptions, 5 touchdowns, with a 91.7 QB rating. McCown was traded to the Jacksonville Jaguars for an undisclosed 2010 draft pick on September 5, 2009. He played as a backup to starting quarterback David Garrard the 2009 and 2010 seasons. On September 6, 2011, five days before the 2011 regular season opener, Jacksonville announced they were cutting Garrard and that McCown would succeed him as starter for week 1. On September 18, 2011, McCown was benched after posting the lowest passer rating (1.8) for a starting quarterback in Jaguars history. On June 7, 2012, McCown signed with the New Orleans Saints. The Saints released McCown on August 28, 2012. The Atlanta Falcons signed McCown to replace the released Chris Redman on August 28, 2012. As Matt Ryan's primary backup, McCown played two games, on September 27 when Atlanta won 27-3 over the San Diego Chargers and December 16 when Atlanta won 34-0 over the New York Giants. On April 1, 2013, McCown signed a one-year deal with the Saints. After solid performances in preseason games, McCown was selected to serve as the primary backup to Saints starting quarterback Drew Brees. During the regular season he attempted a pass but it fell incomplete. In the regular season, McCown was the holder for placekicker Garrett Hartley. 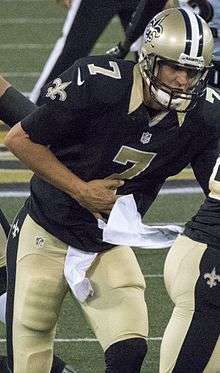 On September 25, 2015, Sean Payton announced that starting quarterback Drew Brees would miss the first game of his Saints career due to a bruised rotator cuff and that McCown would get the start on September 27 against the Carolina Panthers over rookie Garrett Grayson, marking McCown's first start since 2011 with the Jaguars. Luke's older brother Josh started for the Browns the same day, marking the first time the brothers both started since 2007. On November 5, 2015, McCown underwent successful lower-back surgery, effectively ending his season after he was placed on injured reserve. Luke completed 32 of 39 passes for 335 yards and a 82.1 completion percentage in 2015. McCown's brother Josh is also a quarterback in the National Football League, currently playing for the Cleveland Browns. His older brother Randy played quarterback at Texas A&M University. Luke and his wife Katy have four sons and two daughters. McCown is a Christian. In September 2015, he starred in a series of TV commercials for Verizon Wireless, talking about Verizon's reliability and backup generators, joking that "I bet if they just had the chance, some of those backups would really shine." Ironically, McCown started a game shortly after the commercial initially aired due to an injury to Brees, throwing for 310 yards. ↑ "Luke McCown to Return for Idaho Game". Louisiana Tech Athletics. Retrieved 27 July 2013. ↑ "Football Bowl Subdivision Records" (PDF). NCAA. Retrieved 27 July 2013. ↑ "Luke McCown". sports-reference.com. Sports Reference LLC. Retrieved September 3, 2016. ↑ "Historical NFL Wonderlic Scores". wonderlictestsample.com. Retrieved September 3, 2016. ↑ "Luke McCown". nfldraftscout.com. Retrieved September 3, 2016. ↑ Tania Ganguli (September 6, 2011). "Jaguars release quarterback David Garrard". The Florida Times-Union. Retrieved September 7, 2011. ↑ Edward R. Jenkins (September 19, 2011). "McCown finds way into record book". [Jags Report]. Retrieved September 19, 2011. ↑ "Luke McCown". New Orleans Saints. Retrieved October 1, 2013. ↑ "Luke McCown joining New Orleans Saints", NFL.com, April 1, 2013. ↑ Ramon Antonio Vargas, "Reports: Saints cut Seneca Wallace, Luke McCown wins back-up QB job", The Advocate, August 23, 2013. ↑ Vargas, Ramon Antonio (August 20, 2013). "Veteran kicker Hartley putting together solid preseason.". The Advocate. Baton Rouge, Louisiana. Retrieved October 1, 2013. ↑ "Game Summary: Miami Dolphins at New Orleans Saints" (PDF). NFL. Retrieved October 1, 2013. ↑ "Drew Brees ruled out for Saints vs. Panthers". Retrieved 2015-09-25. ↑ "Luke McCown". nfl.com. Retrieved August 4, 2016. ↑ "Luke McCown". pro-football-reference.com. Sports Reference LLC. Retrieved September 3, 2016. ↑ "Walking By Faith: Luke McCown". ↑ "Camp Quotes: Cam Jordan, Jimmy Graham, Luke McCown". Wikimedia Commons has media related to Luke McCown.